Ester offers high-performance flexible packaging materials that fulfill the technical requirements of your processed food products along with the competitive edge they need. Our packaging materials provide processed packaged food with vivid print quality, superb product freshness, powerful taste, aroma protection and extended shelf life. At Ester, we manufacture and supply innovative flexible packaging materials for several reputed processed food brands in the world. Our products are widely used for confectionery, snacks, coffee, ready-to-eat meals, cheese, yogurt, milk powder, commodities (Rice, Spices, Flour, and Seeds etc. ), pet food, Pickles, Nutritional food/fortified flavored powders and ghee (bag in box). Not only are these packaging materials visually attractive, they also contribute towards reducing the packaging’s environmental footprint. Transparent High Barrier film for cheese, meat, ready to eat meals etc. Metalised Ultra High barrier film (EB104IP) for milk powder, coffee, bag in box etc. High Friction film for bulk packaging, pet food packaging etc. 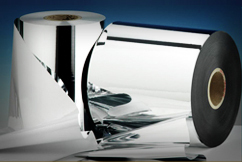 Backed by more than 30 years of expertise in manufacturing polyester films, the Ester’s range of polyester films are largely used across various applications worldwide. Our broad range of packaging materials is developed in such a way to meet the varying needs of our clients. We work closely with customers and supply chain contacts to overcome challenges of packaging products.